Spelling pretests and posttests. There are no spelling groups in my son’s class (when I was that age, we had the “green apple group” and the “red apple group”), but there is certainly differentiated instruction. Instead of being grouped by ability, children are given a pretest each Monday on ten spelling words. Students who can spell at least eight of those words correctly are given a list of more challenging words to study that week (called the “star” list), while the rest of the class sticks with the original list (the “smile” list). This means that there is no rigid differentiation between good spellers and not-so-good spellers: A child might be on the “smile” list one week and the “star” list the next. Moreover, the spelling lists for the upcoming week are included in the weekly newsletter, which is emailed to parents on Friday. This lets my son study the easier words before he takes his pretest on Monday so that he can be on the star list that week. This is his choice, not mine! Spelling has always been a struggle for him, and being assigned the challenging words after a successful pretest seems to be a big confidence booster. Flexible spelling assignments. Each week, students choose three spelling activities from a list of nine and turn them in at the end of the week. There is a wide range of options (they change from week to week), and students are explicitly given permission to replace any of the activities with something else that is not on the list. Some of the activities are quick and fun (e.g. writing your speling words on your parent’s back with your finger) and some are more arduous (e.g. writing down the dictionary definitions). We always do a practice test as one of the three activities, whether or not it is on the list of options for that week. What day did he actually read Bunnicula? Who knows? But he is writing about books, and that’s what matters. Flexible reading log. I have a hard time with reading logs. Though I understand that they are supposed to promote daily reading, I can’t stand the thought of timing one’s reading and keeping a record, as if reading is a chore to be endured. But the reading logs that my son completes each week are flexible enough that we can adapt them to our read-for-pleasure-with-abandon lifestyle. For each day (Monday through Friday), there is a space for students to fill in the number of minutes that they’ve read, but we don’t keep track. My son just writes “20” for each day, though he usually reads for much longer. He has to write one sentence per day on what he’s read, but the sentence can be anything at all, as long as it says something about the book. This really helps. My son needs practice writing sentences about what he reads, but at this point, he doesn’t need something overly prescriptive. 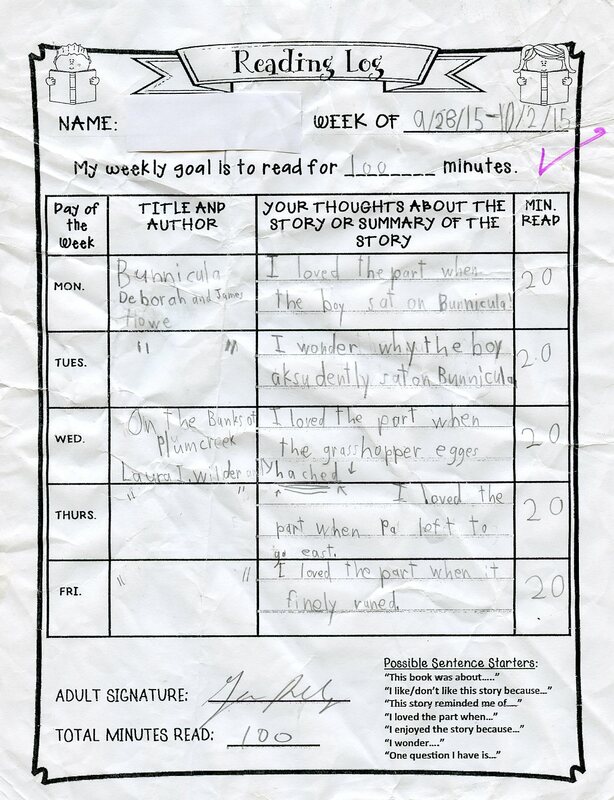 And here’s what really makes the reading log doable for us: We don’t worry about filling in the chart every day. My son does most of his reading before bedtime, and it would be extremely disruptive to have him fill out his reading log just before bed. Besides, reading is pure fun for him, and I don’t want the reading log — a task that he does not enjoy — to intrude on that experience. So he sometimes writes a week’s worth of sentences in one day. He still gets practice writing sentences about what he reads, but its not really a daily log anymore after we’re done with it. And that works better for us. Writing journals. My son’s teacher gives the kids plenty of non-threatening opportunities to practice writing. Writing in their journal for a few minutes is the first thing they do in the morning. They write three sentences in response to a writing prompt, unless it’s a free writing day, when they can write about anything that they choose. They have a separate journal for writing narratives and other longer pieces. The teacher has explained that these are rough drafts, and that they will eventually polish some of these stories, correcting the punctuation and spelling, etc. Reasonable homework. Research suggests that many children have too much homework to do in the early grades. The National Education Association recommends 10-20 minutes a night in first grade, and an additional ten minutes per grade level thereafter. My son’s homework assignments fall within these guidelines. He has plenty of time after school for play, extracurricular activities, and household chores. Students are taught to read and understand what the problem is asking. They underline the question and circle important information. Then they use a strategy that they think will work for this problem (e.g. using a number line, drawing a picture, writing an equation). 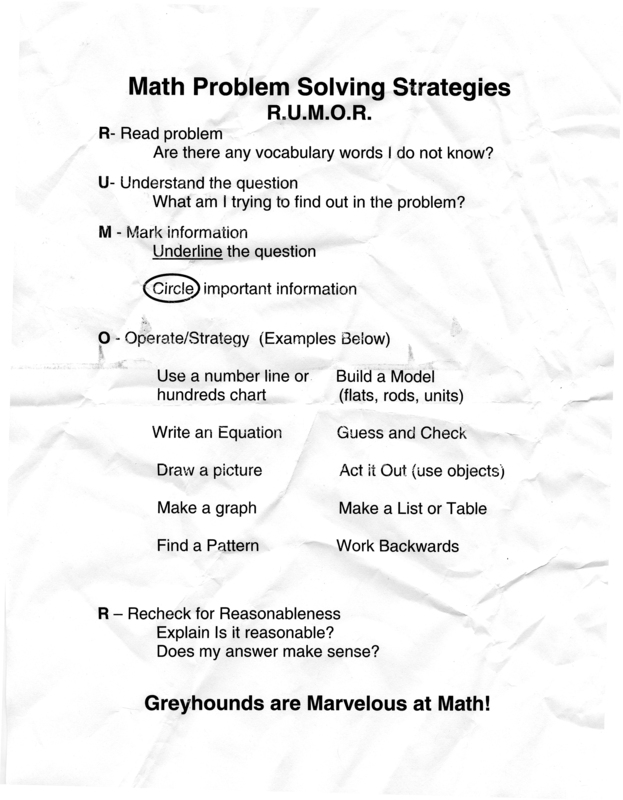 My favorite is the last step: checking for reasonableness. Does the answer make sense? Reform math has been justly criticized for not giving enough attention to standard, efficient algorithms, in favor of finding their own strategies for solving problems. But this is clearly not an either/or proposition. I hope that today’s kids will learn both operational fluency and creative problem solving. What is working well this year for your child? Tell us in the comments. Art Class: Coloring in the Lines?